Stagecoach rides are one of the favorite activities for kids of all ages at the annual Chuck Wagon Gathering & Children's Cowboy Festival in Oklahoma City. This event is held each May on the grounds of the renowned National Cowboy & Western Heritage Museum. There’s plenty of Western fun in Oklahoma for even the littlest cowpokes to experience. Here are some of Oklahoma’s best Western adventures for children and families. Put on by the National Cowboy & Western Heritage Museum in Oklahoma City, the Chuck Wagon Gathering and Children's Cowboy Festival is a Memorial Day weekend tradition that draws 10,000 guests over two days. There’s genuine cowboy fare from the chuck wagon, including stew, beans and biscuits, and live entertainment from comedians to balladeers. 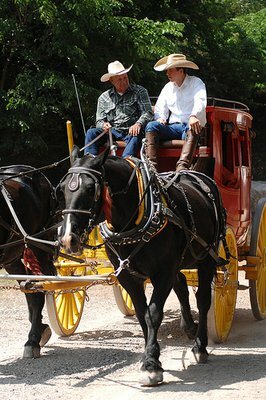 The whole family can go for a stagecoach or covered-wagon ride and try out Western crafts like rope making. There are pony rides for the little ones, too. Red Steagall has performed at the chuck wagon event since 1991. The Official Cowboy Poet of Texas is a master songwriter, recording artist, author, actor, radio personality and rancher. In late July, Pryor is the place to find everything cowboy. The American Cowboy Trade Days and Celebration of the American Cowboy is a tribute to the American cowboy that includes period re-enactments, stagecoach and buggy rides, food and entertainment. Western period merchandise – from handmade quilts and furniture to guns, ropes and saddles – is available from about six dozen vendors who come from 15 states. Visitors are invited to bring their own instruments and jam with the other musicians. There’s plenty of Western fun in Oklahoma for even the littlest cowpokes to experience. Kidsfest is held annually at Woolaroc in Bartlesville, which was established in 1925 as oilman Frank Phillip’s 3,700-acre ranch. Today it’s a museum with a fine collection of Western art and Colt firearms, as well as a lodge and wildlife preserve where buffalo, elk and longhorn cattle roam. Kidsfest, held in late June, has a different theme each year. Historical re-enactments, crafts, games, pony and wagon rides, and food are all included with admission to the museum. Guests are welcome at Express Clydesdales Ranch, home of a truly magnificent team of black Clydesdale draft horses. The ranch is on the historic Chisholm Trail and houses the Yukon Historical Society. Clydesdales aren’t quite as big as Belgians, but they are particularly gentle – even though they weigh in at up to 2,000 pounds, about double the weight of most breeds. The Express team competes throughout North America and can be seen at many local events. Kids can get real cowboy lessons at the Sequoyah Riding Stables in Sequoyah State Park. With 300 acres, the ranch offers guided trail rides, cookouts, campfires and hayrides. Saturdays during the summer, children younger than 7 years old can participate in the Lil’ Wrangler Program. The children get a little riding instruction, choice of bandana or cowboy hat, hot dog, chips, drink, pony ride and photo. Children 7 through 15 can sign up for a weeklong, half-day horse camp available in June. Pony rides are available Tuesday through Sunday Memorial Day through Labor Day.